The next Ingleside community meeting will be held at St. Aidan’s Episcopal Church on Tuesday, August 18, 2015 at 7p.m. The church is located at 101 Gold Mine Drive cross of Diamond Heights Blvd. Refreshments will be provided, please attend. Thank you. "The San Francisco Police Department welcomes dedicated men and women to join us in serving our City. I encourage you to apply to become one of San Francisco's finest." 2. Go to www.nationaltestingnetwork.com, choose law enforcement, and register to take the San Francisco exam ($45). Financial assistance is available. 3. Choose an available exam date that's convenient for you. 5. You will receive an email confirming your exam date, time and location. 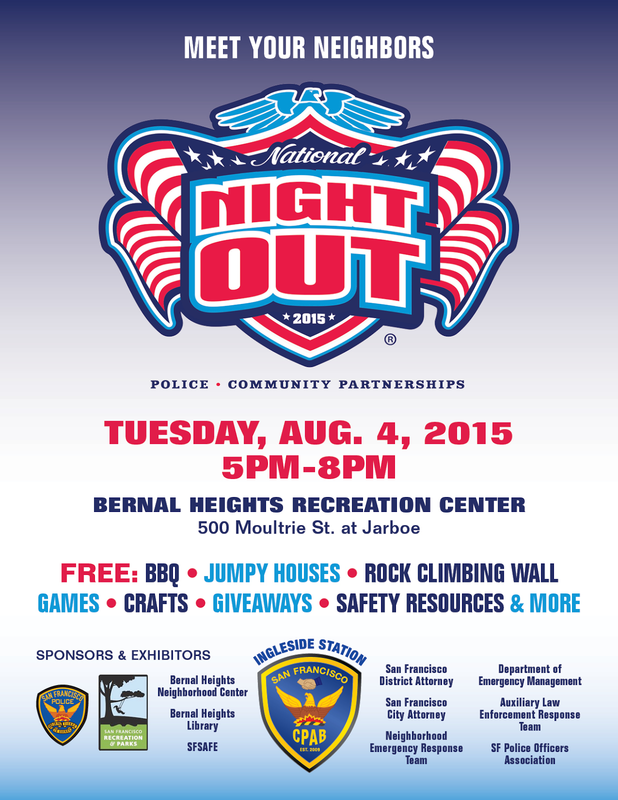 SAVE THE DATE FOR INGLESIDE STATION’S FREE NATIONAL NIGHT OUT BBQ! Please save the date and spread the word! For more information, email Sarah Rogers at serogers@yahoo.com.